Mark Waid’s Daredevil is the only comic book to appear on The A.V. 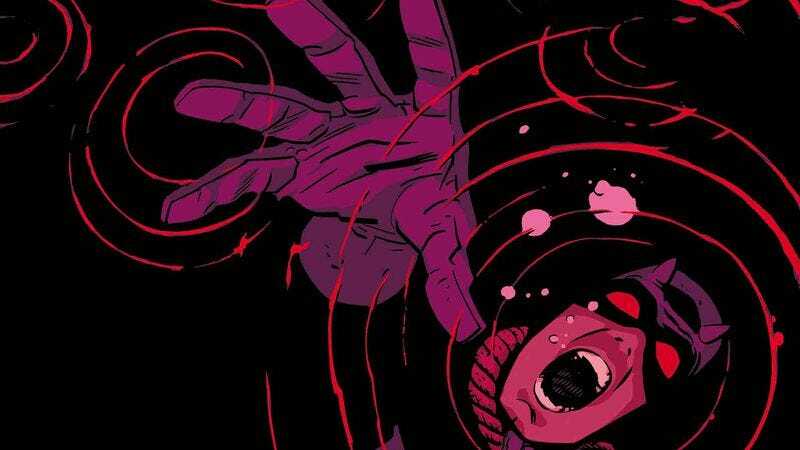 Club’s best mainstream and superhero comics list for the past three years, for its combination of classic superhero action, heartbreaking character drama, and innovative visuals—and for being a consistently engrossing read. Waid’s artistic collaborator Chris Samnee took home a 2013 Eisner Award for his work on the title, and this exclusive first look at their Daredevil #35 showcases the bold layouts and smooth linework that have made Samnee one of the industry’s top artistic talents. Before this creative team moves Matt Murdock to San Francisco for All-New Marvel NOW’s Daredevil #1, it still has some last-minute tricks to pull off—like a rooftop fight between a giant version of the blind superhero and his ex-girlfriend Elektra, who’s also a giant. Dream sequence? Pym particle experiment? Artist losing all concept of proportion and perspective? Find out when Daredevil #35 hits stands on January 15.